Otitis media is an infection in the middle ear and is most commonly seen in children under the age of six. It occurs suddenly, usually with the following symptoms: ear pain, fever, loss of hearing and irritability. The eardrum is often swollen and red. Most cases of otitis media improve with antibiotic therapy, but a chronic inflammation with fluid behind the ear’s tympanic membrane can continue for several months, causing a feeling of fullness or ringing in the ear. In some cases, a doctor will insert a special tube to prevent fluid build-up in the middle ear. Even after treatment, 40% of children will have fluid remaining in their middle ear for a month or longer. Otitis media, or an infection in the middle ear, is a common problem in young children. By the time they reach three years of age, 80% of children will have had at least one middle ear infection. Otitis media strikes boys more frequently than girls. Middle ear infections often occur in young children because their eustachian tubes are narrow and in a more horizontal position than adults’. This causes them to drain less easily than tubes in adults. 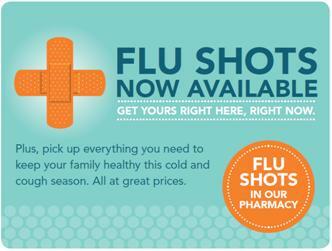 Children also suffer from more colds and respiratory infections, which cause fluid to accumulate in the middle ear. Thus, otitis media is especially common during the winter cold and flu season. Children who have multiple allergies may also be at higher risk for ear infections. Bottle feeding in the horizontal position can allow milk to enter the eustachian tube and cause infection in infants. Symptoms: Although most people associate the symptoms of otitis media with an earache, fever and hearing loss, very young children may not experience any of these symptoms or they may be too young to complain. 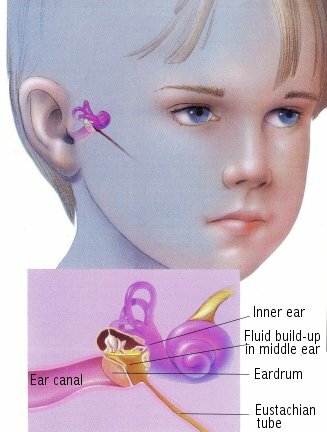 Instead, a sign of infection in some children may be when the child with ear pain tugs or pulls on an ear or shakes his or her head from side to side. Children may also become irritable, vomit, lose their appetite and have loose stools. The diagnosis is made when a doctor examines the affected eardrum with an otoscope (an instrument fitted with lights and magnifying glass), looking for swelling, redness, response to light and movement of the tympanic membrane. In unusual or complicated cases, the doctor will take a sample of the fluid to determine if any bacteria are present and to determine which antibiotics will be most effective. Treatment: Otitis media is treated with antibiotics. The drug of choice is amoxicillin, even though there are a growing number of cases of bacterial resistance to this drug. Other antibiotics may be used if amoxicillin does not improve symptoms within the first 72 hours of treatment or in certain geographical areas where bacterial resistance to amoxicillin is common. Oral antibiotic therapy should continue for at least 10 clays. Ideally, if symptoms do not improve after 3 to 4 days of medication, the child should be examined again. Although some doctors suggest over-the-counter or prescription decongestants and/or antihistamines to relieve fluid buildup behind the eardrum, these drugs have never been proven to be of help to a large sample of patients. Some children will have relief from ear pain with acetaminophen and the application of local heat. Children with a middle ear infection should be re-examined at the end of the treatment period to determine if the inflammation has been adequately treated. When otitis media recurs three times within a six-month period, or four times in one year, preventive antibiotics (prophylaxis) may be given to prevent infections from developing. In a child who does not respond to antibiotic prophylaxis and whose hearing is affected, a tympanostomy tube may be inserted. This tiny tube, inserted into the eardrum, prevents fluid from accumulating in the middle ear and improves hearing during the time when much important language and behavioral learning takes place. If you have any questions about otitis media and required antibiotic therapy, don’t hesitate to ask your doctor or pharmacist.